New Native Plant Garden at Aransas NWR Headquarters! With funds donated by U.S. Fish & Wildlife Service Retirees 2014 Greenwalt Walk for Wildlife, we have been able to rehabilitate the native plant area around the Aransas National Wildlife Refuge headquarters flagpole. The contribution not only allowed us to purchase new native plants, but also to put in an automated irrigation system. This will make the area much easier to maintain, and give the plants a better chance for survival in our hot, dry summers. It took a lot of people to make this happen. FAMI members Ellen Reisinger and Linda Frank did the design for the plantings and irrigation. Mid-Coast chapter, Texas Master Naturalists donated many of the new plants. FAMI President Fred Lanoue and Visitor Services Intern Hannah Plumpton put in the new path. Ellen, Linda, and Fred installed the irrigation and did the planting. Fred, along with Visitor Services Intern Kevin Sun and FAMI member Linda Lanoue spread the mulch. Thank you to everyone involved, and special thanks to Greg Birkenfeld and the Refuge maintenance staff for their help. Come by the Refuge and take a look! 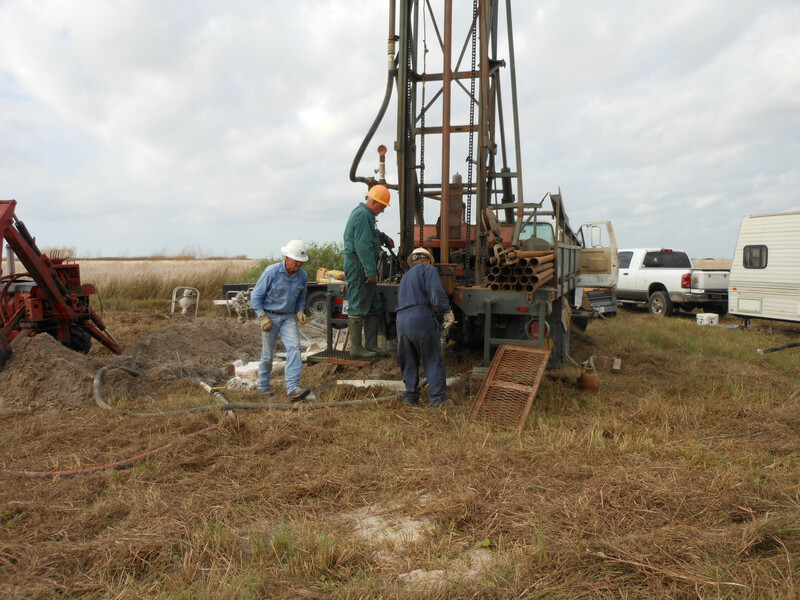 Two New Wells for Matagorda Island! In May, San Antonio Bay Foundation awarded Friends of Aransas $31,000.00 to provide reliable fresh water on Matagorda Island. The money was made available to the San Antonio Bay Foundation pursuant to a settlement agreement with the Texas General Land Office and Kirby Inland Marine. These funds are Supplemental Environmental Project funds which resulted from the oil spill in the Houston ship channel on March 23, 2014 that made landfall on Matagorda Island. San Antonio Bay Foundation previously contributed $10,000.00 to our Water for Wildlife Fund. We were able to supplement those amounts with other money from our Water for Wildlife and Whooping Crane Funds, thanks to individuals that gave donations. A drilling project on a barrier island without road access, electricity, or potable water, and only spotty communication, is no simple matter. Some of the drilling companies contacted didn’t even want to make the attempt, especially since it meant barging their equipment to the island & leaving it there until the project was completed. Happily, Carl Critendon of Critendon Well Drilling Service was willing and able to meet the challenge. We now have two wells on the south portion of the island producing good quality fresh water for the cranes and other wildlife. They are equipped with solar-powered pumps, which have been proven to need a lot less maintenance than the old windmills. Aransas National Wildlife Refuge management & staff, especially Felipe Prieto, were instrumental in getting this accomplished. FAMI President Fred Lanoue spent many hours coordinating the project and never let the obstacles and difficulties deter him from the goal. 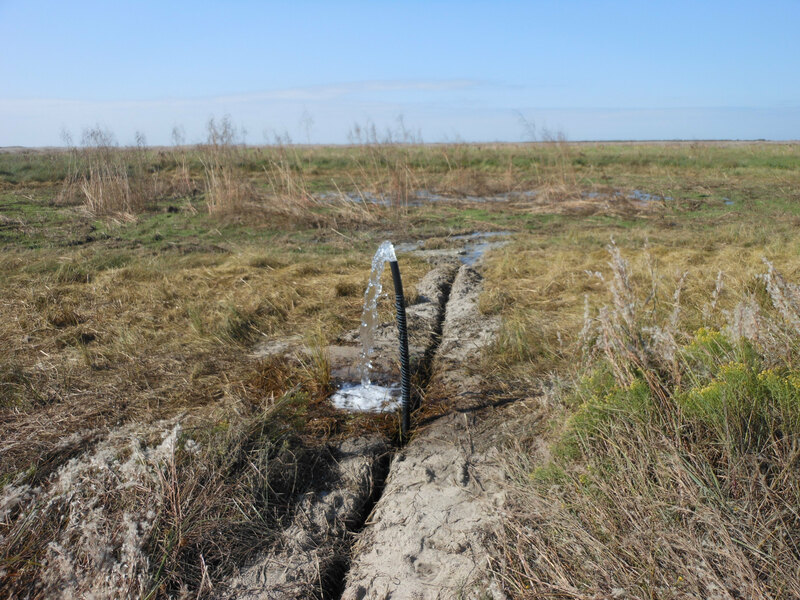 Thanks to San Antonio Bay foundation and everyone else involved, Whooping Cranes and other wildlife will have reliable fresh water on the southern end of Matagorda Island, even when dry conditions return to south Texas. 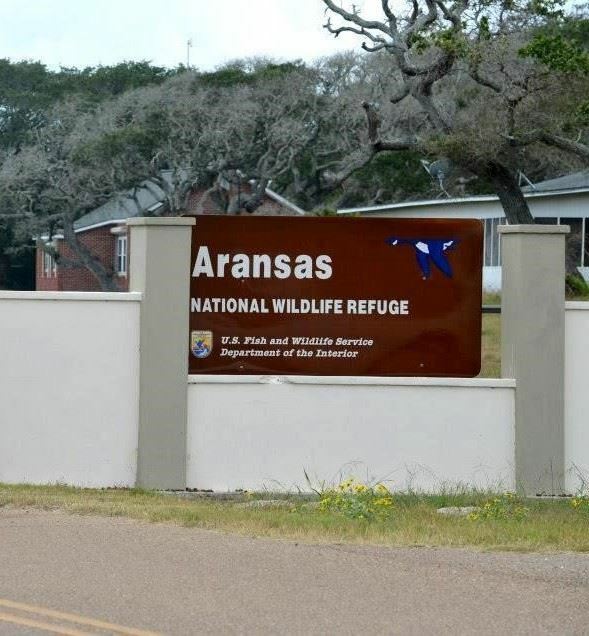 Aransas National Wildlife Refuge Visitor Center to be Open 7 days a Week! From October 15 - April 14, the Refuge Visitor Center will be open every day from 9:00 a.m. until 4:00 p.m. Be sure to stop in to see the exhibits and find out the latest news about the Refuge from the friendly staff & volunteers. Aransas NWR Christmas Bird Count Set! Mark your calendar for Tuesday, December 22, and plan to come out for the Refuge Christmas Bird Count. Paul Swacina is taking the lead again, and Steve Reisinger will be co-compiler. It's a great way to enjoy a day of birding at the refuge, and the information collected by observers helps in the study of the long-term health and status of bird populations across North America. The Christmas Bird count is one of the longest-running citizen science projects in North America. You don't have to be an expert to participate. Even brand new birders can help spot birds. Beginners are placed with more experienced birders; it's a good way to learn, and meet other birders. There is no charge for the event. Friends booth at HummerBird a big success! We had a great time at HummerBird Celebration. Our sales were good, earning money to help us support Aransas National Wildlife Refuge projects. Even better, we had the opportunity to talk with a lot of people about the Refuge and our Friends group. Best of all, Refuge Project Leader Joe Saenz and Visitor Services Manager Laura were able to join us part of the time to meet people and tell them about some of the exciting things going on at the Refuge. Thank you to our members Patrick Rios, Linda Frank, Melanie Konarik, Ron Smudy, Fred Lanoue, and Linda Lanoue for making our booth possible. 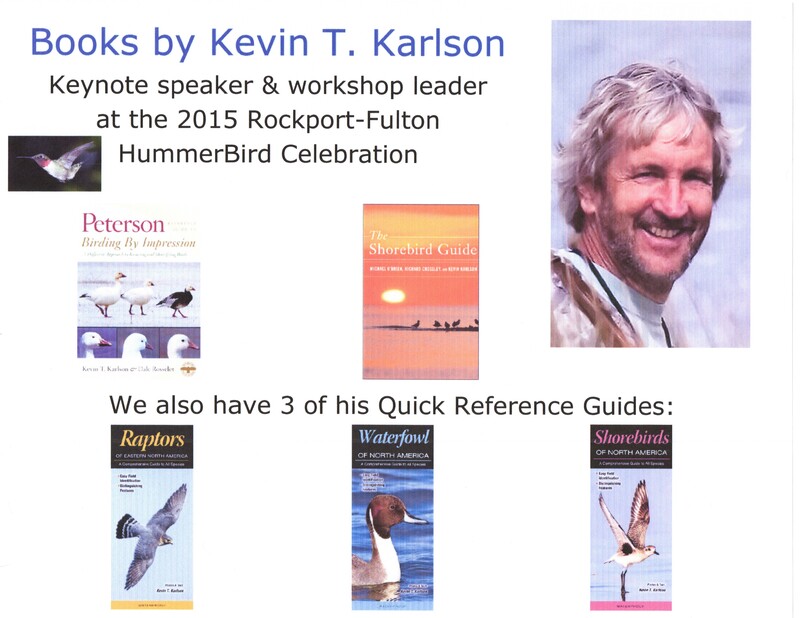 The 2015 Rockport-Fulton HummerBird Celebration is this weekend, & we'll be there Friday 9/18-Sunday 9/20. We will be featuring books and Quick Reference Guides by Kevin T. Karlson, keynote speaker and workshop leader at the festival. His new book is Birding By Impression, which teaches a simple approach to bird identification by noting basic characteristics. His book, The Shorebird Guide, is widely recognized as being one of the best on the subject. We also have his tri-fold guides: Raptors of Eastern North America, Waterfowl of North America, and the recently released Shorebirds of North America. Besides books for all ages, we'll have our popular Whooping Crane Recovery and other shirts, a good selection of the amazing recycled Jabebo earrings, and much more. As always, we'll have free information about Aransas National Wildlife Refuge, and gladly answer any questions anyone might have. in our nature store in the Refuge Visitor Center after HummerBird. Grant awarded to Friends of Aransas! 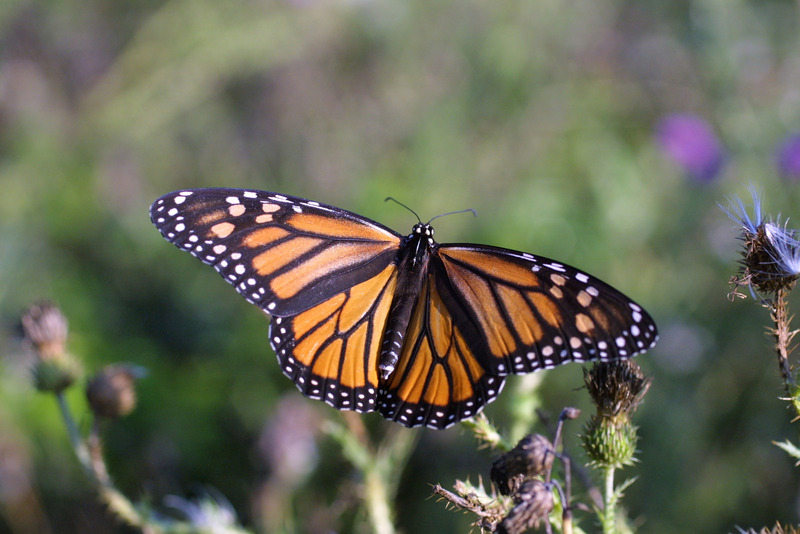 We have been awarded a grant through the National Fish & Wildlife Foundation to create an interpretive pollinator garden at Aransas National Wildlife Refuge. The grants were awarded through the National Wildlife Refuge Friends Grant Program, a collaborative effort between the National Fish & Wildlife Foundation, U.S. Fish & Wildlife Service, the National Wildlife Refuge Association, National Audubon Society, and Enbridge. The garden will be created in an unused area beside the Visitor Center parking lot, and will feature native plants known to attract Monarch & other butterflies, as well as other pollinators. It will serve both to provide safe habitat for native pollinators, and educate the public about the benefits of, and relationship between, native plants and pollinators. We will be reaching out to other groups and individual members of the community to help with this project. If you're interested in becoming involved, or would like more information, please contact us. Friends of Aransas is partnering with Aransas National Wildlife Refuge to treat and monitor invasive Honey Mesquite (Prosopis glandulosa) on the Tatton Unit of the Refuge. The Refuge received a grant to work with Friends and Refuge volunteers to mechanically remove mesquite, and apply herbicide from a UTV. The Tatton Unit is the largest remaining section of coastal prairie in the area. Without treatment, mesquite will continue to spread and cause additional strain on all flora and fauna that rely on these valuable and limited grasslands. The target area is Tatton Unit T7, which is 98 acres. Currently mesquite is estimated to cover 40% of that unit. It is hoped that 100% of the mesquite will be removed from that area. More help is needed. If you're interested in helping, please email us. Jennifer Brown has joined the Aransas NWR staff as Environmental Education Specialist! Jen grew up in South Florida, and graduated from Florida International University in Miami with a Bachelor of Arts degree in Environmental Studies. After graduation, she became an Environmental Education Intern with USFWS at the Southeast Louisiana Refuges Complex. Jennifer later worked in the Louisiana State Park system at the Louisiana State Arboretum and Bayou Segnette Sate Park. 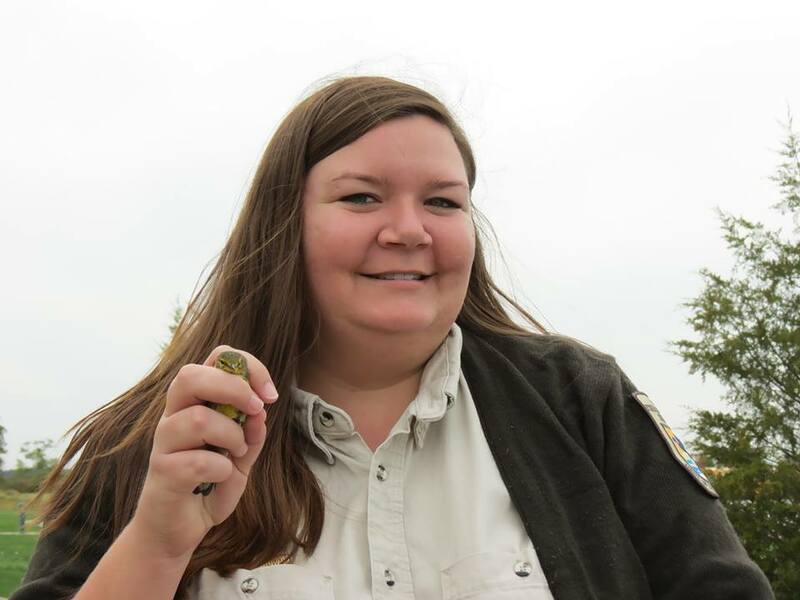 She returned to USFWS as a temporary ranger at Ottawa NWR, where she wrote and was awarded a $50,000 grant to improve the Environmental Education program and cover her salary. She then worked in the VISTA program for a year, before going to the Texas Mid-coast Refuge Complex. While at Mid-coast, she worked with their Friends group to facilitate hands-on field trips and educational special events. Jen comes with high praise, not only from her former employers, but also from Friends members at Ottawa and Mid-Coast. We are pleased and excited to welcome her to Aransas! Hilcorp Energy representatives visit Aransas! Representatives of Hilcorp Energy visited Aransas NWR July 7th. Jill Fisk, Asset Team Leader, and Justin Furnace, Corporate Manager of External Affairs, came to learn more about Friends of Aransas, and to tour the Refuge. Earlier this year, Hilcorp Energy joined the Friends at the Corporate level. During the meeting, ideas were exchanged for possible future projects. They were later given a tour of the Refuge by Friends Director Ron Smudy and Board President Fred Lanoue. We're excited about this new partnership and look forward to working together. If you'd like to see more about Hilcorp, visit their website.